Crystals, stones, and talismans have fascinated mankind for centuries. From the earliest findings of amber and jet in the Baltic regions and in Europe as far back as 30,000 years ago, there has been a great value placed on them. It is thought by many that crystals have healing and cleansing properties... and that is how they are most known and used. Ancient Sumeria and Ancient Egypt placed a mystical value on crystals and they were included in spells and magicks. Healing stones and protective amulets were part of their daily lives. Some had specific uses... peridot was thought to protect against bad dreams or negative energies while one would sleep. Jade, which is thought to encourage serenity and focus, has had a special significance in China for centuries. Crystals have been found in prehistoric graves, indicating that ancient man put a special significance upon them. It is believed that these crystals would insure safe passage into the next world. In ancient Greece, hematite was used as protection for soldiers in battle. Hematite, when oxidized, produces a blood-reddish hue... and soldiers would rub the hematite over themselves, asking the gods for their blessings. The word "crystal" actually comes from the Greek word "krustallos" or "ice rock". When molten rock from volcanoes cools and becomes a solid mass, crystals are formed. If the cooling process is fast, small crystals will form... and the slower the process, the larger the crystal. The longer the crystal is at the mercy of the elements, the more detailed it becomes. They are rich in the minerals they were formed from, and have been revered by many as one of Mother Earth's finest gifts. Jewelry and amulets are made for wearing or placing in the home... and some crystals are used in their raw form for healing practices. Using crystals in healing is based on their ability to retain and channel energy. Holistic healing practices date back to ancient times and are still often used today. Crystals play an integral role in this. The energy from the crystal is used to re-align the body's energy when there is an imbalance. This is done for spiritual, emotional, and physical healing... and many hail it as highly effective. A well known and highly popular form of this is the Japanese Reiki, which comes from the words Rei, or the Creator's wisdom and Ki or life energy. In Reiki, crystals are used to balance a person's energy. By this philosophy, a person's energy levels determine how the body will react to and heal from an illness. The crystals are placed at certain points on the body when a person is in a relaxed and receptive state. The crystals absorb the energy as the healer is there to provide comfort and counsel. The person receiving the healing should let the healer know if there is any point where the crystal feels "wrong" or uncomfortable. 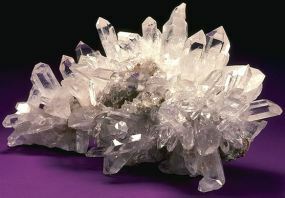 This has been said to happen when the crystal has absorbed all of the negative energy, and at this point, the crystal needs to be removed from the body. This is by far one of the most popular crystals for personal use. The rosy pink hue gives it a beautiful glow, and is used for healing both physical and emotional heart issues, and has a calming effect. It is often used in making jewelry and is said that wearing a rose quartz in a necklace will keep sadness and negativity away. If you are having difficulty sleeping or with nightmares, this crystal is thought to bring relief from that. It is also a calming, relaxing crystal, intended to bring peace. Physically it is thought to be helpful in blood sugar disorders and imbalances. This particular crystal is used to keep negative energy at bay, especially negative energy from others. It is often placed throughout the home to guard against any visitors that might drain your space of positive energy. This has been used since the time of the Ancient Egyptians to focus confused energies and thoughts with the goal of weeding out what is unnecessary and getting to the heart of an issue. This is a crystal you would want to have for times of excess stress. These crystals are used in aiding the contact of spirit messengers or spirit guides. It is believed this particular crystal is able to cleanse itself of excess energies, as its very essence is that of balance. Just remember when buying a crystal, always have it cleansed of any energies that might be on there from before. Some suggested ways of doing this are to burn sage and have the smoke surround your crystals and focus any energy outward. It is believed then that the smoke carries past energies away. Placing the crystals in an area where they can have constant exposure to the sun and moon for a period of time will also cleanse it of any negative energies. Now of course the question comes into play of the effectiveness being more the power of believing the crystals work... but consider what we do know. Crystals are formed from minerals deep within the earth, and they have been shown to hold an electrical charge. Electricity is a form of energy, so when it is said that crystals are able to store energy, it has basis in fact. We as human beings are receivers of all aspects of negative and positive. When there is an imbalance, it is entirely feasible that crystals would have the ability to "tune" the body back into a more equalized state. It's certainly something worth considering. Would you like to add something to this page or make a suggestion? The Vampire | Are Vampires Real? What is the truth?